Hello everyone! I hope your week is off to a great start! I am hoping that this week goes by quickly! Ready for another weekend - lol! Today the weather is going to be yucky! And I don't mean as in snow or rain. Nope. It's going to be windy and dusty. UGH! So not good for the allergies! And it just makes me grumpy! So I do hope that today goes by quickly! It's good for Nick that there is no soccer practice today! Today's card was done for the Create with Connie and Mary color challenge. I also used with my stamp club this month! A super easy card with bright fun colors! Super simple! I love that it could be used for other reasons to celebrate than just birthdays! Don't forget that week 2 of the Cards "Create"tions Celebrations edition is going on right now! If you are not a subscriber it is not to late to sign up and join the party! I hope to see you there! 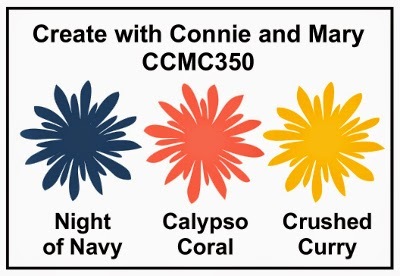 There is more information at the Create with Connie and Mary website. Be sure to check out what the other designers did with this fun color challenge! Thanks for stopping by and have a fabulous day! Great use of the colors - they really pop off the white background beautifully! I love the confetti trail you have made across the card - so fun! Thank you for joining us at Create with Connie and Mary! Love it, Deb! Very happy card! Love how you used the Birthday Bash stamps on a base other than the banner (even though I love that one too) The Label framelits give a different look and the confetti is quite fun! Such a great use of the colors this week! Thanks for joining us this week at Create with Connie and Mary! 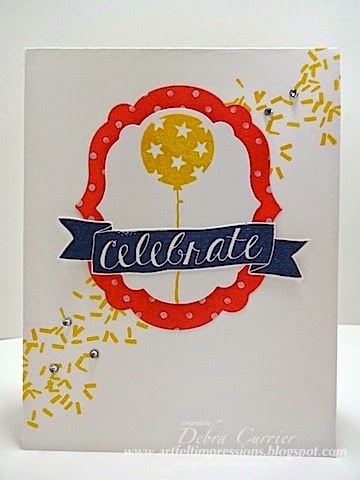 Love the confetti across the background - it adds such a fun flair to your already cute card! Thanks for playing along with us, Deb. So cute, love the confetti in the background...wonderful CAS birthday card! Thanks for playing along this week! Looks like we were on the same wavelength this week! LOVE the confetti background and showcasing the single balloon! Thanks for joining us this week. Great CAS card - I love how the banner looks across the framelit shape for a different look and the confetti sprinkles are so fun! 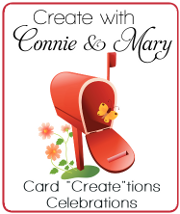 Thanks for joining us over at Create With Connie and Mary this week.